I’ve decided that my new favorite thing to knit are hats. They don’t take much yarn. They don’t take much time. They always look nice. And if it’s a baby hat, just multiply those last three sentences by five – and the cute factor by ten. I really like knitting baby hats. I found myself a new [free] pattern, not too far off from Miss Abby’s hat, and casted on. I knew that I was going for the bear look, so I chose heathered brown yarn from Vanna’s Choice. And I now know I don’t care for that particular yarn. It looks very nice but I think my fingers may have gotten spoiled with all the wool I’ve been knitting with. Damn you, fingers. So after I finished one, I casted on for a second to use up the yarn. And then there were two nice hats. Did I not mention that they’re super cute too? How could I forget that morsel of information? My bad. Yeah, so they’re super cute. 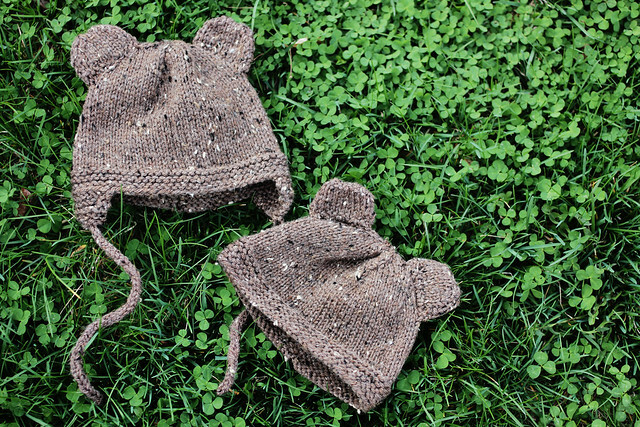 One skein made the entire hat with ear flaps and then one hat and one bear ear. Luckily, Bev at knitting class had extra of the same yarn and I was able to knit up the second bear ear to have a complete set of ears. And… done. I actually gave these to some gals at work. They both had little boys several months back and with these knitting up larger than expected, I thought they’d last at least through this year’s winter. I got see some pictures of the little men in their hats – I died. Seriously, my heart stopped because they were that darn cute. THAT is the reason why I’m loving this knitting so much right now. I love to share. *Pattern: Lil’ Devil Baby Hat by Kitty Schmidt. Opted out devil horns for bear ears. Brent - Can I put in an order for one or three? katie o. - is it wrong that I want one of those hats for myself? Ben - I wish I could commission you to knit me some baby hats! Brooke - @Ben – I bet Little Monster would be super cute in a knitted hat. But he rocks the newspaper hats so well!